Businesses are moving mission-critical applications to the cloud at a rapid pace. The cost savings and other benefits simply are too persuasive not to move to the cloud. So why do organizations hesitate? Analyst studies cite security concerns as the number one inhibitor of moving sensitive applications to the cloud. NetSentries, as part of its Pre-Cloud Security Consulting, performs risk assessment of the existing on premise IT infrastructure, policies, procedures, operations etc. in order to aid the customer to choose the type of cloud design based on the business impact and risk exposure. 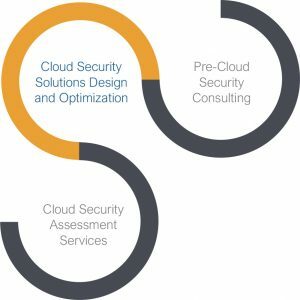 As the trusted Information Security Partner in your Journey towards Cloud, our comprehensive Cloud Security Consulting portfolio includes Pre-Cloud Security Consulting, Cloud Security Solutions Design & Optimization and Cloud Security Assessment Services. Analysis of the current security level of your infrastructure: systems, networks, virtualization, operational processes, client separation, development processes, compliance requirements and source code security. Prepare a roadmap for migration to cloud considering your existing infrastructure and compliance requirements. Development of conceptual ideas and solutions in terms of architecture, systems and networks, processes and the development of cloud applications for companies that are planning to develop a private or community cloud. Determine possible attack scenarios in Cloud and define plans to defend. Thorough security evaluation of cloud providers during the selection process that includes security, functionality, compliance, and economic viability. Identity and access management - Solutions in cloud should provide controls for assured identities and access management. We help organizations to build secure cloud solutions by assuring the identity of an entity is verified and is granted the correct level of access. NetSentries help organizations to build state of the art policy rules around various types of web access which can be enforced via web security technologies. In a cloud/virtual environment, network security is provided by virtual devices alongside traditional physical devices. NetSentries offer assistance in designing of security services that allocate access, distribute, monitor and protect the underlying resource services. NetSentries offers assistance in building Cloud based Email security solutions that provide control over inbound and outbound e-mail, thereby protecting the organization from phishing and malicious attachments, enforcing corporate policies such as acceptable use and providing business continuity option. The growth of virtualization and massive multi-tenancy is creating new targets for intrusion and raises many questions about the implementation of proper intrusion management and protection in cloud environments. The cloud security experts from NetSentries provide design and optimization assistance for cloud based Intrusion detection and prevention systems. NetSentries offer assistance in building Cloud-centric business continuity and disaster recovery by making use of the cloud's flexibility to minimize cost and maximize benefits. Design, Build, Operate and Maintain your Cloud SOC with the assistance of Industries best SOC consultants. We offer end to end SOC consulting services from procurement consulting to the optimization of SOC with relevant use cases, correlation rules and report definitions. Within the cloud, data loss prevention services should be offered as something that is provided as part of the build, such that all servers built for that client get the data loss prevention software installed with an agreed set of rules deployed. Our experienced consultants will help you to design and develop the cloud solution with proper data leakage protection. Security Assessments are third-party audits of cloud service providers or assessments of on premise cloud systems based on industry standards. Traditional security assessments for infrastructure and applications and compliance audits are well defined and supported by multiple standards such as NIST, ISO and CIS. NetSentries has developed a proven internal framework for the current state assessment of the client cloud environment. The purpose of the Cloud CSA Service is to analyze a Customer’s cloud environment end to end and provide higher visibility into their existing security posture across a wide field of view. This is a broad security assessment for those organizations that need a macro view of their environment to ensure all of the Cloud industry recommended security best practices are implemented, vulnerabilities are fixed, security controls are in alignment with the Information Security Policy and Compliance standards, Threat monitoring is effective, Policies and Standards are well developed and maintained, Access control and Content Filtering is effective, Risk Register is properly maintained, Logging and Auditing is proper, Incident Response measures are well developed and implemented, Patch Management is up to date, Security Architecture is flawless and End Point and Network Security Controls are properly implemented. The regulatory environment has become more complicated because organizations often find themselves required to comply with multiple regulations and industry mandates. As new threats emerge, regulations and standards continue to increase in number and complexity. Now, many laws carry penalties for data breaches and for not meeting timely notification of those affected. These areas of concern are addressed as the cloud environment continues to evolve with the utilization of encryption methods are incorporated as organizations define their strategy for cloud control. The benefits of security frameworks are to protect vital processes and the systems that provide those operations. A security framework is a coordinated system of tools and behaviors in order to monitor data and transactions that are extended to where data utilization occurs, thereby providing end-to-end security. Cybersecurity Framework that is based on the NIST framework that can be applied to any industry. The cybersecurity framework is employed to build an information security program. (NIST, 2013, 2014; SANS, 2016). Control Objectives for Information and Related Technology (COBIT) aligns IT with strategic business goals. This framework is commonly used to achieve compliance with Sarbanes-Oxley (ISACA, 2015). The Payment Card Industry Data Security Standard (PCI DSS) is used by merchants for credit card processing. The first step utilizing a framework is to determine what industry-specific compliance requirements apply to the business. Cross-reference tables are available for overlapping security controls to meet compliance requirements across the multiple frameworks that apply to an organization. Implementing a comprehensive framework prevents an adverse impact on the organization by enabling resilience and improved defenses. Frameworks must be utilized in an appropriate context. Standards are a generic solution to an extremely individualized problem set. Cybersecurity connects directly to business strategies and operations and must be tailored to the organization. The audit methodology utilizes an information-centric approach to review data, processes, and provide applications for clouds, hybrid, and on-premise environments employed by the organization. NetSentries cloud controls and policies review include experienced consultants who know where to look for compliance gaps with applicable mandates and recommend steps to remediate those gaps. Deep understanding and knowledge of various compliance requirements guarantee an effective assessment to identify whether you are meeting compliance guidelines. Experts also provide additional direction to improve your cybersecurity.